Editor’s note: This is part three of a three-part series on precision irrigation by Caleb Midgley of Iteris. For the final installment of this irrigation scheduling blog series – please read part one and part two if you haven’t already – I’ll begin with a sobering reminder: there is no magic recipe for facilitating ag technology adoption. Despite there being countless books promoting strategies to drive the adoption of technology across various market segments – not least Geoffrey Moore’s renowned “Crossing the Chasm,” which I mentioned in part one of this series, there is no all-encompassing treatise on how to successfully take new technology into a complex market like agriculture. As challenging as it might be, however, I believe we can cross this chasm in precision irrigation adoption. And my hope is that my experiences from working closely with growers over the past year to trial precision irrigation scheduling technology might help digital ag innovators set themselves up for success. As a technologist, it can be comforting to believe that the unknowns in your data and underlying equations are small enough that they can be ignored. But, in reality, it isn’t so easy to understand the impacts of these unknowns, and whether they are inconsequential noise or something that, if accounted for, might lead to unforeseen linkages? 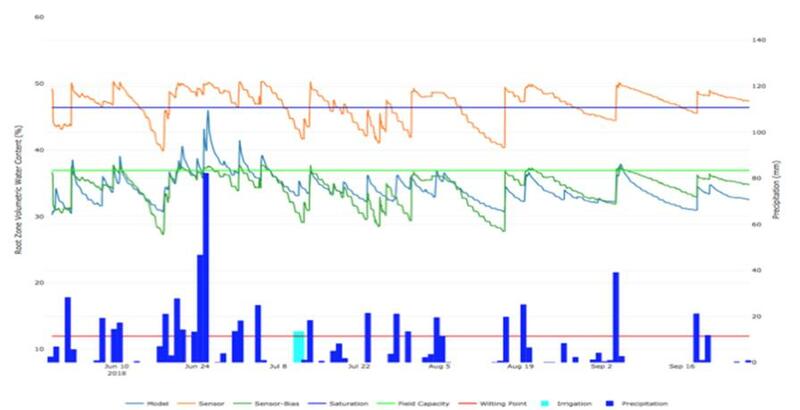 For instance, if one were to view the following chart of soil temperature (Figure 1), it would appear that the virtual sensor (“Analysis”) data is becoming erroneous after May 2015. However, communications with the maintainer of this soil temperature probe resulted in a discovery that flooding had removed part of the soil layer at the station site, resulting in a warm bias with the sensor due to its closer proximity with the surface. As you can see, assumptions can be misleading. Figure 1. 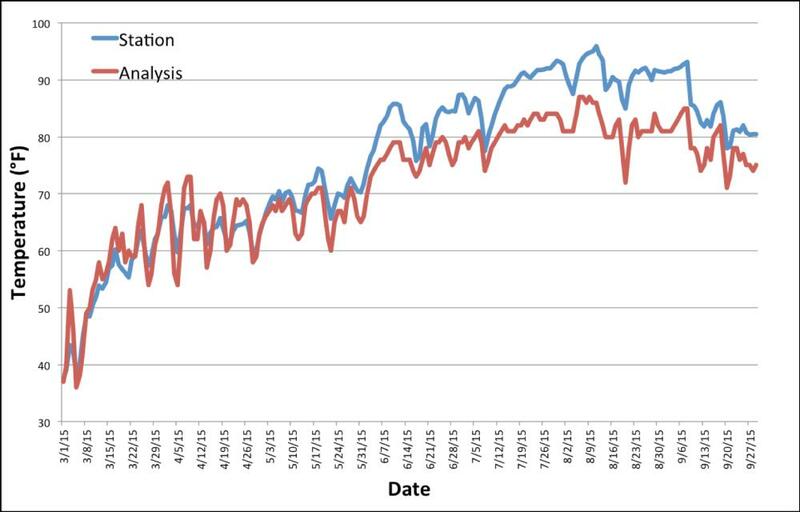 5 cm soil temperature plot of physical sensor (“Station”) and virtual sensor (“Analysis”) data. Highly trained PhDs and software engineers will be no stranger to other unknowns when deploying their technology into a grower’s field. But what if we took those same tech experts and encouraged a dialogue with agricultural experts to identify the unknowns their algorithms don’t account for? It was one of my goals in 2018 to facilitate this kind of dialogue. Figure 2. Sensor installation for testing. I spent some time in Nebraska at the beginning of last year working with some very open-minded growers who were keen to trial precision irrigation technology. The setup consisted of installing IoT sensors and concurrently running a virtual sensor irrigation scheduling solution to draw comparisons between the two. This wasn’t simply a scientific exercise. We genuinely wanted to understand how the hard science would collide with the real world, knowing that just because the physics is right doesn’t mean it will mesh with real-world logistical considerations. As a technologist, you might never have grown a corn crop yourself. But by working with a trusted advisor that the growers trust, everybody will sleep better at night. Parachuting in, selling a solution and then moving on to the next client is a shaky proposition at best. Make sure you have a solid plan to support the user of your tool to ensure long-term adoption, including consulting with trusted advisor advocates. During our field testing in Nebraska, the growers couldn’t find a window to apply fertigation due to the amount of rainfall that occurred. As you will see in Figure 3, the frequent blue spikes represent rainfall events that kept the moisture pretty much at field capacity for much of the season (light green horizontal line is field capacity and the dark blue horizontal line is saturation). This may seem like a missed opportunity to test our recommendation capabilities, but we gleaned some valuable insight from the growers. Figure 3. Example of physical probe and virtual sensor data plotted together. Orange is probe data, blue is virtual sensor, green is the probe data minus a bias due to non-calibration of the probe data. One of them admitted that other growers were beginning to irrigate around him, but he held off at the behest of this new precision irrigation technology, which forecasted significant rainfall, and saved him good money in fuel and water use. Oh, and it did rain! So it became obvious that the prognostic skill was a valuable piece of this technology. We also validated that the crop models were accurate and able to support optimized irrigation recommendations. Crops love to grow when it rains so we had plenty of data to work with there. 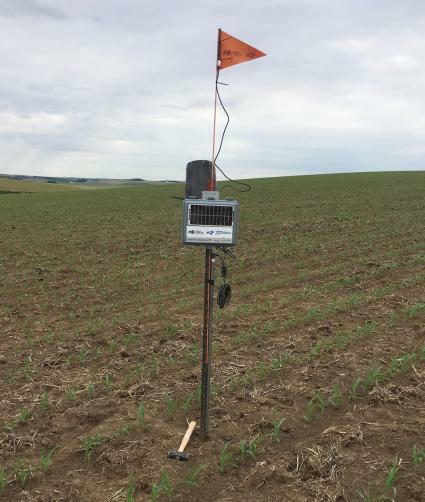 Finally, with the copious rainfall, we had plenty of opportunity to see how the virtual sensor handled the frequent soil moisture changes in comparison to the physical sensor. We started this series talking about various irrigation scheduling techniques. Does your precision solution solve all the irrigation problems under the sun? All technologies have sweet spots and other areas where they struggle, so what do you do? Find out where your technology shines and partner with those who can bolster your solution where it falls short. That partnership could be going to market with other service providers with a robust combined solution. Maybe it’s bringing in trusted advisors to alleviate the risk of adoption. Either way, know the strengths of your tool and apply it well to ensure adoption is not stifled by the misuse of technology in the wrong place. If you leave a sour taste in the grower’s mouth by forcing a square peg into a round hole, we’re all going to hear about it. The potential for agtech to help growers become more profitable while enhancing their quality of life is growing. Which is why I’m so passionate about developing strategies to help encourage adoption of precision irrigation technology. 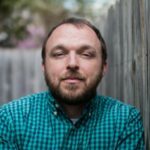 By working together in a smart way, with a willingness to try new techniques, we can help bring about a revolution in how irrigation practices are handled. As the grower, trusted advisor, and the technologist move to a suite of precision technologies from the early adopter stage to the mainstream majority, we can get the next wave of innovation in the hands of the early adopters and the chasm will be crossed sooner than later. Caleb Midgley is Product Manager for Irrigation Scheduling Support Solutions at Iteris. He has a B.S. and an M.S. in Meteorology with 10+ years of experience in applying innovative science to solve real-world solutions within client-facing platforms, with experience in both the government and private sectors. Follow Iteris on Twitter @Iteris. See all author stories here.